We went to the Zoo this weekend. Last year my son was not quite old enough to appreciate the visit. This year we all had a blast. The picture above was my favorite shot of the day. I wish that I could see life through his eyes for just one day. The little things that make him so excited. The wonder in his eyes when he sees something new. I love this age. He is still so sweet and innocent. When he looks at me with those big blue eyes, my heart just melts. My daughter was so excited to give me the card and bracelet she made at school. Those handmade gifts mean so much more than any gift you can buy. I want to freeze time and keep my kids this age forever. I had the perfect Mother's Day weekend. Thank you everyone!!! Head over to Mother May I for some more great shots. What a great capture of his expression! I agree... I love this age when everything is a mystery. I love the perspective I get on life when I try to see through their eyes; things I took for granted I no longer do. What a great photo! I love the reflection, and his expression of awe. It is amazing to view the world thru thier eyes! Oh, I LOVE that picture!! The reflextion, his expression, the lighting -- just perfect! He is a cutie! This is a beautiful picture! Love all the greens. I love how you captured the reflection in the glass -- a perfect shot! Excellent capture! 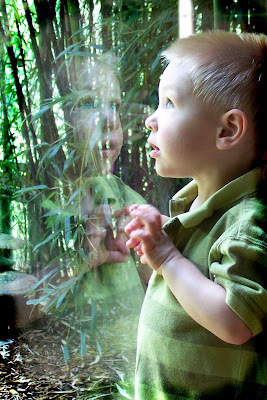 I love the reflection of him and his wonder! Very nice. An excellent photo! I love how you captured your son's face in the glass. You see one side of his face from the lens and then glimpse the other through the window... great!